XPOT belonging to the RAN-GTPase exportin family that mediates export of tR from the nucleus to the cytoplasm. Translocation of tR to the cytoplasm occurs once exportin has bound both tR and GTP-bound RAN.This gene encodes a protein belonging to the RAN-GTPase exportin family that mediates export of tR from the nucleus to the cytoplasm. Translocation of tR to the cytoplasm occurs once exportin has bound both tR and GTP-bound RAN. 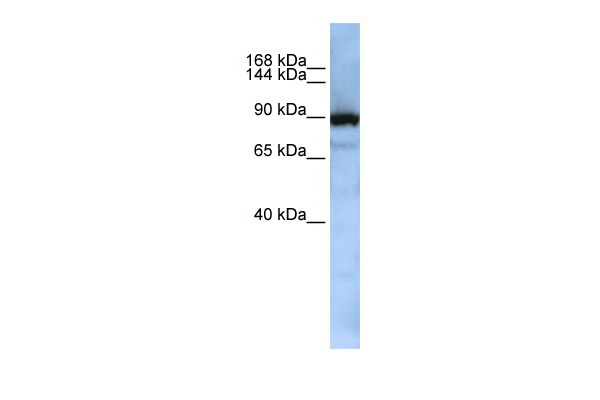 XPOT MaxPab polyclonal antibody. Western Blot analysis of XPOT expression in human kidney. Western Blot analysis of XPOT expression in transfected 293T cell line (H00011260-T01) by XPOT MaxPab polyclonal antibody.Lane 1: XPOT transfected lysate(105.82 KDa).Lane 2: Non-transfected lysate. Western blot analysis of XPOT antibody (C-term) (AP17842PU-N) in NCI-H460 cell line lysates (35ug/lane). XPOT (arrow) was detected using the purified Pab.